Declare that America has a moral duty and an obligation to the rest of the world to sell ice to the eskimos. Land 50000 American troops in Lapland. Force Eskimos to hold an election and rig it in favour of an American born Eskimo for President. declare an exclusive trade treaty with America for purchase of ice in exchange for seal-skin chemises for wives of Republican Senators. And when civil war breaks out in Eskimo land, scratch head for some time, consult speechwriter then declare in a thundering voice before well-briefed oil-lobby sponsored press cameras that that "AS LONG AS I AM YOUR COMMANDER-IN-CHIEF, THE WILL OF THE AMERICAN PEOPLE,SHAPED BY GOD,SHALL PREVAIL. Great post. I'm still laughing. This must rank as one of your best posts.. :-). Loved your choice of words and sentences.. Kudos to ganja turtle! And if somebody questions the need to sell ice to eskimos, then question his patriotism and label him as a traitor and a flip flopper. You just brought to life the Marketing Guy's Ultimate Challenge..as smbody rightly pointed out->like selling combs to baldies ;-).ROTFL.Outrageous.Whats ur inspiration for this one? Excellent, hilarious; your posts are a serious health hazard:-) My stomach and back were aching by the time I finished reading. The graphics at the beginning is excellent. Keep posting. the ending was too good, and you never fail to amaze me.. just too good. You heard of the story of the rookie marwari sales men in a super store in US who made a 200,000 dollar sale on his 1st day. The store manager surprised and amazed asked how he did it. Rookie replied, "well he came asking for a fish hook so I sold a small hook and then a big hook and then a bigger hook. I then sold him the all the diff kinds of bait. And since he was to go fishing I told him not takle the new fishng boat, so I took him to boat section and sold him a Boat, and since he couldn't possibly tug along the boat, I sold him the Trailer." The manager amazed, " so you sold a boat to a guy who came to buy a fish hook". sales man replied," no he came to buy sanitary napkins for his wife, so I suggested, since your weekend is screwed anyway why don't you go fishing"
This is the question that usually pops up in all the marketing & advertising classes. I bet no one can better you Silverine. loved the addition of hte igloo pict. Very apt. By the way Dr.Pissed was refering to the video of the song "You're Beautiful" by James Blunt.The video shows snow and the character jumps into the sea at the end of the video. "Now that I think seriously about it, I feel it IS possible to sell snow to an eskimo. How do eskimos make igloos? It must be hard work I think. Can we sell them interlockable snow bricks? 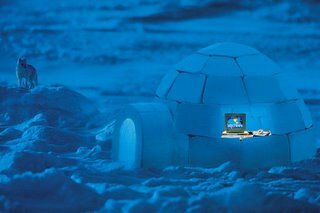 If we can make snow bricks, which are strong as well as have a hollow space inside, the igloos might be warmer (although it will be still below 0C) - air being the best insulator. Also this might result in safer igloos as temperature rise - no blocks of ice will 'peel off' and smash an eskimo's head as the bricks will be interlocking now..."
nice one ...as usual ..
Ah! *slowly getting red.... either in shame or anger* that's what I used to do earlier! But fantabulous post.... as usual. Actually, that's Maslow's esteem need that the MG gets at, and hell he does it well... I'd like to be MG.
Did the guy start selling Icebergs too. You did read PG wodehouse I am sure. He leaves this on the impressionable. @Esvee: it's a lovely song, I found the video here! @monk and Camphor: Thanks again! @Anonymous: I am one of those rare souls who have not read Wodehouse. I did try but never quite liked Wodehouse. Selling Icebergs is a good idea and whether he sells it or not depends on me right? And if your reading depends on my writings then I suggest you pick up a Wodehouse. Wodehouse does things to the impresionable I heard. marketing is an art ..even tho we talk crap abt it :-) . my friend ( studying in a leading management institute ) is concentrating on marketing and we tease him asking why he had to work hard to get into the institute ..was it just to become a door to door salesman :-) .. I guess they should include ur post in the Harvard Curriculum...Well u could for furthering sales accept bio-degradable Seal Skins as payment..
btw am keen on some Purple Icy snow for my 1 bhk Koramangala apt. Whr can i place the order?? Payment will of couse be in Biodegradable old Newspapers, empty beer bottles and scratched CDs..Interested?? keep up posting...i just love em ! Read this curiously, since marketing is one thing just I can't do. Probably because I am very skeptical (journalists have to be; if not, the profession will make them to be). The more a marketing guy brags about the product, the less inclined I become to buy it. For ages this was the gauntlet thrown in by marketing profs to their wonder-eyed first year students who wanted to sell anything to anyone. Now that you have finally popped their bubbles i can imagine marketing people grumbling about mar comm dept. If after providing those idiots (the mar comm dept i mean) with loads of money n free time (to blog!) all you can expect by way of thankx is such sarcastic posts, one might as well as get rid of them. Seriously, the post is so hilarious that it opens the window to a rather embarrassing episode in my life that happened about 3 years back. Self was spending time in a Scandinavian country known for bombshell babes. We were supposed to do a project on consumer behavior. Managed to get admitted as the sole male member into a group of 3 of the bombiest bombshells. Alas, the prof had different ideas on how to encourage cultural mingling and allotted us the project of launching a new toilet paper (oh yeah!!!) instead of shall we say condoms. Project was in tatters, my plans were not working, and i knew i had to come up with whopper of an idea soon or else my grades and my plans for “xtracurriculars” would be worth less than used toilet papers. As usual the idea stuck and i swear i was not in the toilet when it happened! Excitedly i presented the idea of "Cool Blue". No more plain vanilla boring toilet papers. This would be in a soothing light blue colour and the paper will be treated with menthol to give a soothing feeling to you know where. Long hours of giggling later, my project mates give in to the idea. The GAL still refused to go out for a date with me but with a sly twinkle in her eyes, which gave me hope! After several brainstorming sessions, i was selected to make the presentation to a packed audience of people who were bored with their plain vanilla toilet paper. The presentation went well, i could hear more chuckles than sniggers, and i received a thunderous applause at the end! On concluding remarks by the chief guest (CEO of one of the largest paper making co in sweden), i received a special mention for "innovative" ideas and the audience again fell out of their chairs laughing. I was proud of the reception of my idea untill i noticed that the prof was almost purple with indignation and giving me dirty looks. Suffice to say, soon i was hounded out of the marketing world in sweden, with the prof suggesting that my ideas are too revolutionary for marketing!. But I drew solace from the fact during one staid boring faculty student dinner, the prof’s 6 year old daughter came upto me and asked if I were the guy who came up with the “menthol laced toilet paper” and then wouldn’t leave my side during the entire evening! @Pradeep: Me too.I trust word of mouth only! The pic was awesome !!!! can i meet him ??????????? heh heh !!! the homeo doc was funny. lol...i cherish those days i wud read ur posts over and over again and laugh my guts out...loved the eskimo!!! You should seriously consider changing careers. Very few people are blessed with the humor sense and creative writing that you have. Who sold you your current career over writing? ....so that you wake up healthy and raring to eat. i havent finished laughing yet!!! is marketing this miserable ??? @deepa:Nice to have you back :)Thanks for your kind words. Now I am off to your blog. @Jiby:Thanks and please keep posting about your ROFL escapades. @Vinod: I still write as a profession but it is boring brochures, presentations and ads :)Thank you. Btw, this is such a humourous, well-told post - Keep it up! You managed to bring a marketing cliche statement to life. Kudos! Awesome.. Well, is this creativity at its best or, did u happen to get involved ins something of this sort? Lol.. Either way, hilarious description.. Kudos !! I will send my event manager to you so that you can fix the date and other contractual stuff. My endorsement manager will let you know about the photography and video rights and restrictions. Once you are ok with the terms and conditions, the rest as they say, will be history. @deepa: Neck deep in work dear. Will post by Monday. Awesome post..Vely vely funny !! Are you still a copywriter? (i can see that you are a copy writer).I like those scripts.I'd like to work with you someday. Silverine, im still going through all your posts and here am I, commenting almost after 3 years! Of all posts, I think this one takes the cake! I'm amazed as to how you manage to crop up one such smashing idea after another. Okay.. Now that the confusion is settled that I can't get into marketing.. :P Lemme get on with what I actually wanna say ..